I thought I'd live in silence forever . . . and then I met him.I'll never be able to hear, but music has always been a source of comfort for me. Rather than listen to the rhythm, I can actually feel the beat pulsing through me. It's pure bliss. So the moment I saw Thorin playing his guitar, I was mesmerized. I'd never seen anything more beautiful . . . or intimate. I couldn't tell where his body ended and the song began. He's everything I need in my life . . . I'm falling fast, hard, and deep. This book sucked me in from the very beginning. I instantly fell in love with the characters. Marie took a real life situation and made us see it through a different perspective. With this book, we see how to total opposites will communicate with one another on a far more deeper meaning. Thorin and Harper are total opposites to say the least. Thorin is a thriving musician whose career is starting to take off. Harper is deaf who is trying to be as successful as she can be. I loved Harper and how she looks at the world. She has come a long way in her life with everyone been disregarding her because of her being deaf. But she has not let that get in the way of achieving her goals. She is making her way through her career without letting her disability get in her way. Harper has to work twice as hard to get to the same page as everyone else. Thorin hasn’t had a great childhood which results in how closed off he is now. He is used to just focusing on his music and keeping his bed warm on a daily basis. When Harper comes into the picture it becomes a game changer. He starts to feel things has never felt before and he doesn’t know how to handle them. With Harper though, he becomes a different person. He wants to be better because of her. Thorin opens himself up when he is with her but still keeps his past hidden. I absolutely loved Harper, who she is on the inside and her outlook on life. She is always so positive about everything. Growing up her parents have treated her a certain way and her mom still tries to control her life. Her relationship is not a close one. Harper has overcome everything, not letting anything get in the way of her dreams. She is achieving well in school and is on her way to a great career. And she has not let being deaf get in the way of her love for music. Music brought the two of them together. I love how Thorin is with Harper. He doesn’t let being deaf stop him from getting to know her, rather he uses it to get to know her better. Thorin is the sweetest with him, even going as far as learning how to communicate with her. He will do anything for her. Thorin is seeing life in a different perspective because of her and he is not taking anything for granted. But Harper feels that it’s too good to be true and is waiting for the shoe to drop. Her thinking, “what would a musician want with a deaf girl.” Plus her past experiences show that nothing good will happen to her. But their connection is undeniable. Will Thorin and Harper ride through their differences? Or will their past make it all go tumbling down? Is their connection strong enough to keep them together? 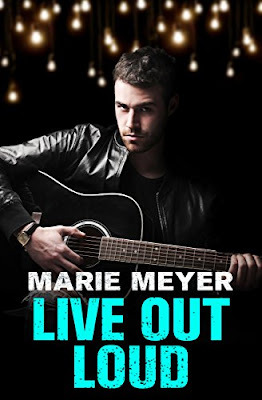 Marie Meyer is a teacher who spends her days in the classroom and her nights writing heartfelt romances. She is a proud mommy and enjoys helping her oldest daughter train for the Special Olympics, making up silly stories with her youngest daughter, and bingeing on weeks of DVR'd television with her husband.